Want to be notified of new releases in Defconbots/2015_Competition_Rules? These are the official rules for the Defconbots 2015, tower defense, competition. If you have questions or comments about the rules create an issue in this repository. Robots that go against the spirit of the contest will be disqualified. This is a robotics contest not a language contest -- don't try to exploit some loophole in the wording of the rules -- don't be that person. Where N is the target number '1','2','3','4','5' or the character '*'. And TT is an ID assigned to you at the contest. Target number hit IDs will be addressed below in the "Call Your Shots" section. All messages are ASCII-encoded. 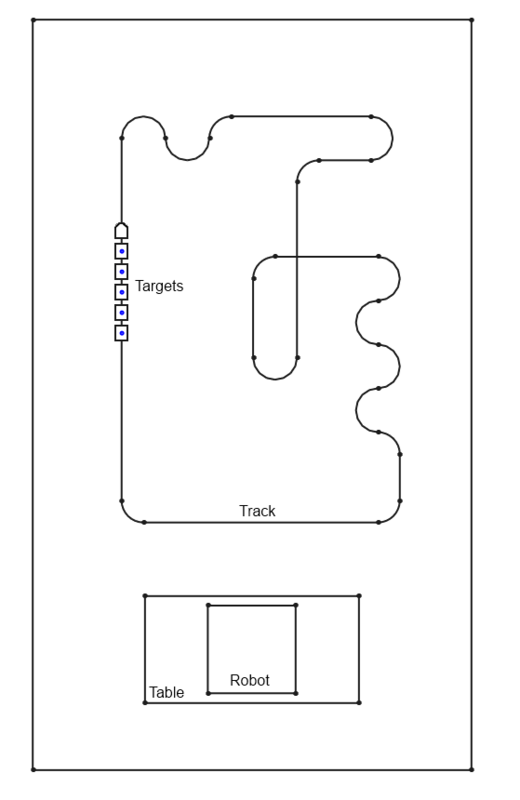 Initially all targets are illuminated and "alive"
Initially the train will move at the nominal speed (0.25 m/s) and speed may change if your shots are "called"
There are two possible ways to send a laser hit message to a target -- with the wild-card('*') or with a specific address ('1' to '5'). If you decide to use the wild card then you may attempt to hit any target and as soon as the laser hit message registers a hit will be counted, the target will continue to move at normal speed, and the target illumination will cycle normally. Each wild-card hit will add 100000 points to your score. The final ranking will be determined by the finals times for the people that were in first through fourth, followed by the runners up in order of their qualification score.